Place cut-up chicken and onion in the water and cook slowly until tender; add salt. Remove and cut the meat into 1-inch pieces and return to broth together with corn that has been cut from the cob, celery and seasoning. Continue to simmer. For a richer broth, add 4 bouillon (chicken) cubes to the pot. Add 2 cups of cooked noodles or 1 recipe of rivels (recipe follows). 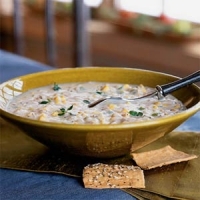 *Two cups of canned or frozen corn may be substituted for fresh corn. 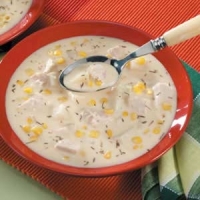 Recipe categories: Soups & stews, Chicken, Chowders.